We sell CTC/DOT Cascade Systems. Air cascading simply means equalizing the pressure between the cylinder to be refilled and the next lowest supply cylinder. If this doesn't get the desired pressure in the small cylinder, the supply cylinder is turned off and the next highest supply cylinder is opened and the pressure allowed to equalize between the two cylinders. UN/ISO cylinders can be mounted vertically or horizontally and are used in a stationary or mobile application. UN/ISO cylinders must be hydro-tested every ten (10) years. 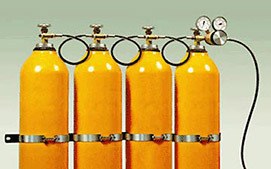 No 10% overfill is available with these lightweight style of cylinders. DOT exempted cylinders are hydro-tested every five (5) years but are not manufactured any longer. Follow us on social media for limited specials and inventory updates.